Elizabeth Wise [D6931] - $13.98 : Yarn Tree, Your wholesale source for cross stitch supplies. Cross stitch pattern by Barbara Ana Designs. 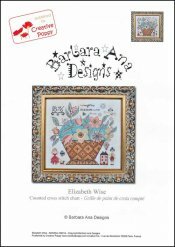 Elizabeth Wise by Barbara Ana Designs is a cross stitch piece designed in the manner of an antique sampler, with the designer projecting herself as 14 year old Elizabeth Wise. The basket is the main component, almost overwhelming, as if the young girl had been a little over-enthusiastic and almost run out of fabric, the other elements being tiny and squeezed in the corners. The woven part of the basket is a solid, geometrical and elaborate design. In total contrast, the flower and fruit overflow freely from the basket, a symbol of abundance and prosperity. The colors too reinforce the contrast, with earthen colors of the basket enlivened by the joyful pastel colors of the fruit and flowers. Stitch count 124 x 120. Stitched on #8030 Newcastle Linen Cream.